Health & Vim, May 1912. A highly interesting and vivid account by PERRY PEAKE of a young girl whose jujutsu methods of self-defence are arousing widespread comment. In common with most men, I suppose, I had always held the opinion that the athletic feat-performing woman was of the Amazon type—a heavy, fleshy person of powerful build and unattractive appearance, the contour of whose form was spoiled by overdeveloped muscles and disproportionate girth. When therefore it was understood that I should be introduced to Miss Frances Weste as the typical “Jujutsu Girl,” I confess to no sense of pleasant anticipation, but rather to a feeling that I had before me something in the nature ‘of a call to duty with which I had no choice but to fall in. I knew what it would be—a big, muscular, large-handed and large-footed sort of elderly body, and I had visions of her shouting at and hauling unsophisticated pupils about with more energy than grace. “Jujutsu,” I knew, was a scientific application of the knowledge of the susceptible and vulnerable part of the body to methods of protection and defence against personal attack. “That is Miss Weste,” said my cicerone. We stood in a hall at Queen’s Gate, South Kensington, and a party of young women before me were engaged in a number of evolutions that were quite foreign to me. I looked for the lady, but there was no stoutly-built, muscular phenomenon that I could see. In fact, the person taking most interest in the proceedings was a beautifully made young girl with flowing golden hair, who stood smiling at what was going on. I could not see Miss Weste, and said so. That Miss Weste—that slender little lady a Jujutsu exponent—it was past belief. But it wasn’t when I saw the lady herself take a hand in the proceedings. I sat down and watched, and soon became fascinated at the sight of this delicately-nurtured girl initiating her pupils in some wonderful ” tricks”—for that is what they seemed to me. I saw them release themselves from one another’s grips on the wrists, throat, body, hair, arms, and legs, by the simple process of “touches,” or knocks on nerves here and “locks,” “trips,” and ” throws ” there. They went through the facings in the art of “breaking their fall,” and I was told that this prevented broken bones and dislocated joints should they happen to slip and fall in a scrimmage with an assailant. I saw an elderly woman throwing herself down on the mat in such a fashion that it looked as though she must break every bone in her body. But what I did not observe was the outstretched palm of the hand, which touched the mat a fraction of a second before the body so as to take the force of the fall. She sprang up again with the nimbleness of a kitten. On another section of the mat space a young girl of about fifteen was rolling head over heels and beating the mat with hand and foot which method, I afterwards learned, was a “breakfall ” for the “stomach throw” and prevented concussion of the brain or a broken spine, which would probably occur to a burglar who was “stomach thrown” as a defence for an attack on the throat. On another corner of the mat two ladies were exercising their muscles and acquiring a supple and graceful body by means of resistant movements. These movements were executed by the pupils taking it in turns to resist in a mild way each others endeavours to raise an arm or bend the body, or to gently force each other back or pull forward. 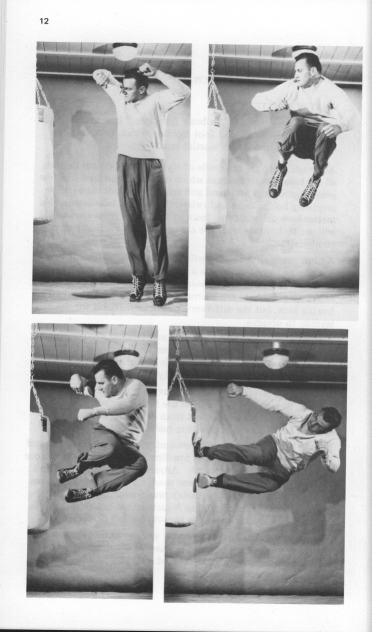 These are really splendid developing exercises, and are the more interesting as they are done by two people, although there are many movements which may be done individually. After waiting a few well-spent minutes watching the pupils, Miss Weste came up to us and initiated me into a few of the mysteries of this marvellous Japanese art. In answer to questions, Miss Weste informed me that she had been trained principally by Professor Garrud, of the well-known Jujutsu Institute, in Golden Square, W., although she has had many lessons from the Japanese themselves. 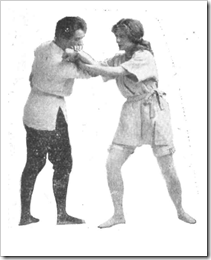 She has taught hundreds of ladies how to defend themselves, and has given numerous exhibitions of Jujutsu at garden parties, gymnastic displays, and concerts, and a little while ago gave a demonstration at the Institute of Hygiene before a large audience of physicians and doctors, who complimented her highly upon her most useful accomplishments. Fig. 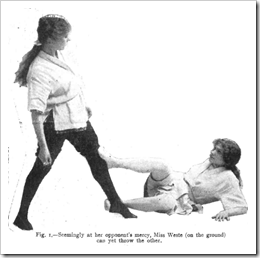 1.—Seemingly at her opponents’ mercy, Miss Weste (on the ground) can yet throw the other. She released her companion, and changed her tactics. Fig. 3.—Another arm-lock by Miss Weste. Fig. 4.—The arm-lock, with leg across throat. Fig. 5.—The shoulder-throw, used when the throat is caught in a an attack from behind. “What did you do ?” I asked, feeling that this display of strength bordered on the uncanny. In the grouped picture on the previous page [see below] (Fig. 2) the “Jujutsu Girl” is showing an arm-lock on Prof. Garrud, whilst two lady pupils are showing another form of arm-lock. On the left Prof. Garrud’s arm has been twisted up the back, and Miss Weste has placed her foot upon the upper arm and the shin behind the forearm. The assailant is now held firmly by the foot and the shoulder can be easily dislocated by a pressure of the shin against the forearm. The arm-lock by the two pupils is done by placing your right arm under your opponent’s left elbow, holding the wrist with one hand and your assailant’s coat with the other. Fig. 2.—Showing Miss Weste holding an adversary down with one foot, and two of her pupils in an arm lock. Miss Weste went on to say that Jujutsu was immensely suited to ladies, inasmuch as it did not call for great strength. All the methods in the Japanese art were accomplished by skill and scientific application. Jujutsu was only practised in Japan by the Samurai, or fighting men, and all its secrets were guarded jealously by them and handed down from father to son until about forty years ago, when the Mikado decreed that it should be taught in the public schools, and that the methods should be secret no longer. Now nearly all the Japs practise the art as a sort of a national pastime, and it is as well known in Japan as boxing, football, and cricket are in England. We have been fortunate enough in securing some very excellent photographs by Jacolette which we reproduce here. Longtime Cincinnati resident Leonard (“Len”) Lanius, born around 1865, claims he was the lightweight champion wrestler of the world at one point. That would have been around 1890 and I have verified that he did at least referee a match in 1894. In fact, the loser of the bout gave Lanius some lip, whereupon Lanius promptly removed his coat to take care of business. Police interference prevented it from going any farther. Once, while speaking about the Gotch-Hackenschmidt bouts, Lanius noted that “it was the invasion of the Jap wrestlers around that time that put me to work on perfecting a style of defense to check their attack. Their methods were quite baffling.” That, of course, led to his publication of American Jiu Jitsu: The New Art of Self Defense in 1922. His career is quite varied. As a boy, he went to Cincinnati and shined shoes and and sold papers for a living, his father having died of consumption before Len was born. He took up wrestling at around 12-13 or so as a sickly lad who had been told he might not reach twenty (didn’t they all start sickly when they’re sell books? ), but the wrestling cured him and he became a champ, boasting he once went seventy matches without a fall. He traveled with the circus and on the vaudeville circuit, then later retired from wrestling and joined the sports staff at the Cincinnati Post. He also coached for several years at the Ohio Military Institute in Cincinnati. He occasionally spoke on the radio about wrestling for WLW. By 1921 Lanius had entered the field of optometry and was still going strong, visiting out of state optometric conventions in 1933. (He was president of a Cleveland optical factory in ’33). But his early passion was chickens (so to speak). According to census data, he was the proprietor of an optical store by January 1920 and had a wife, looks like her name was Minnie, some 9 years younger than he. He wasliving in Cincinnati, and he had a 23 year-old married son, Ralph D. Lanius, who managed his optical store. In March of 1921 Lanius demonstrated to the members of the Rotary club his “Yankee Jiu Jitsu” at the Park Hotel. The Rotarians particularly enjoyed when he boosted his demonstration partner (Dr. Otis G. Morse) over his head. You know those crazy Rotarians. 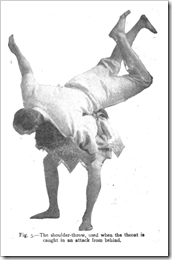 On June 9, 1921, Lanius gave an exhibition of his version of jujutsu at the Busy Bee cafeteria during the Kiwanis club program. He was one of the principal features! This was the opening of the Christen Kenton club and there were over 100 attendees. That’s a lot of Kiwanis. But it was during his early circus/vaudeville traveling days that a bachelor friend gave Lanius two hens and told him to fatten them up and then invite him to dinner. That was the beginning of a beautiful man-poultry partnership, and by 1917 Lanius was known all over Ohio for his poultry passions. In fact, he was the president of the Ohio branch of the American Poultry Association for three years, as well as a licensed poultry judge. The papers would even run his photograph whenever his fairground lectures were advertised. By 1912 he owned the College Hill Poultry farm in Cincinnati and by 1917 he also owned the G.E. Conkey Co. of Cleveland. It appears that there wasn’t hardly a single fair or poultry meeting at which Lanius failed to lecture, although the 1917 lectures were mainly ominous warnings of the grave shortage of either poultry or eggs that loomed on the horizon due to the cold season causing a grain shortage. Luckily the country appeared to survive the hen/egg catastrophe. In case anyone is wondering, he sold layers, including White Leghorns, Buff Leghorns, White Wyandottes, D.C. Rhode Island Reds, and Buff Orpingtons. All facetiousness aside, I bet the guy could spin some tales or he wouldn’t have been invited to speak at all those events. Too bad nothing really survives but his book. Speaking of which, I scanned a copy almost exactly three years ago and passed it around. I see there is now a version floating around on the web. I don’t know if it’s the one I set free, but if you do a little Googling, you should be able to find a place to download it. Yep, that’s the one I scanned a few years ago, same signed dedication as my book. I can’t believe no one ever bothered cleaning it up, especially since I provided it in MS Word. Anyway, you can download a copy here, but be warned, I never intended for it to be released to the public in that state, I was just doing a quick scan for friends. If you have any further information on old Len, please shoot me an email. Indianapolis Star 2-9-1912, 9-1-1917, 10-5-1918. The day before the Martin Luther King, Jr. holiday seems an opportune time to recall the suffragettes now that the U.S. has a woman and an African-American as top contenders for the presidency. [FN1]. It is incredible to think that only 80 or so years ago women in the U.S. and U.K. did not enjoy the same voting rights as men. I quite literally cannot imagine that anyone in either country today thinks the same, and yet it was so recent that some of our older population undoubtedly can recall living in that period. Militant suffragettes eventually upped the physical level of their own campaigns and smashed shop windows, burned and even bombed on occasion. When caught and imprisoned, they went on hunger strikes which led to forced feeding through nasal tubes, yet another government public relations disaster. Edith Garrud, wife of William Garrud, taught jujutsu to the Woman’s Social and Political Union “bodyguard” and used her school as a hideout when the heat was on from the police. William Garrud was well-known as a health and strength and self-defense instructor and owned his own gymnasium before he became associated with the Tani/Miyake school in London in the early 1900s. After Edith and William were divorced (or perhaps before, during, and after), William also taught jujutsu to his paramours. 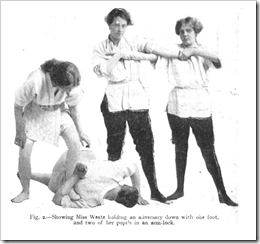 Tony Wolf’s article, “Edith Garrud’s Dojo” in the Bartitsu Compendium. There is also a brief militant suffragette section with illustrations at the University of Glasgow Special Collections Women’s Suffrage page, which saved me scanning a hardcopy of the illustration above. FN1. I know there has been discussion of who has been the most disadvantaged, women or African-Americans, but I’m trying to avoid that in this context. For that, Steven Barnes for one has brought up the discussion on his blog here and here. As far as voting, African-Americans technically gained the right in the U.S. in 1870 with the ratification of the 15th Amendment to the U.S. Constitution. Women received the right only in 1920 with the ratification of the 19th Amendment. On the other hand, African-Americans were often disenfranchised based on (mainly southern) state laws requiring poll taxes, literacy tests, vouchers of “good character,” and disqualification for “crimes of moral turpitude.” So the Voting Rights Act of the 1960s may be a better point to begin counting. Even now, gerrymandering is still regularly fought in court and if you were a black voter in Florida during the 2000 election you might be wondering how much things have really changed in the last forty years.